This is the darkest and deepest and most fruit-driven of our 2014 pinots, the most overtly Californian in style and substance – so probably the most popular! 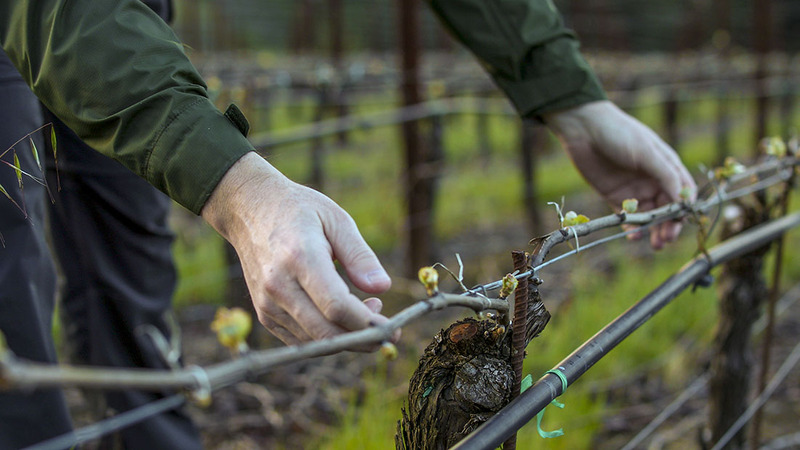 We’ve produced wine from these thirty year old vines since 1996 so have a level of intimacy with them that is unrivalled – we can predict how they will perform each season based upon the amount of winter rain they receive and that’s why this wine is so consistent each year. In a dry early vintage this cool, north-facing hillside will ripen a little later than other warmer sites but it will use that extra maturation time to produce small dark powerful grapes that ooze richness and depth. This is not a wine harvested at higher ripeness – it’s no higher in alcohol than its stable mates – but it’s a product of non-irrigated old vines with a substantial level of ‘vine extract’ that age brings. The wine, most similar in style to the 2010 bottling, will naturally find many fans and has a long life ahead of it – 10-12 years will be no problem. Dark brooding fruit flavors: black raspberry and vineyard-typical black cherry compote. Anise, rosemary and mint leaf then smoked meat. Bold fruit entry, obvious concentration and density but always fresh and pure. Blackberry sweetness, rich and broad, palate-staining. Lingering cherry pit and bergamot tea finish. A powerful muscular wine with layers of deep fruit and classic Californian broad texture, but always nuanced, complex and fresh, never heavy or simple.